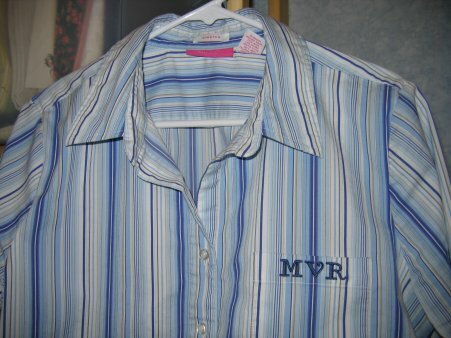 I was looking for an alphabet that was short in height ... no more than 3/4"... so I could put my initials on the breast pocket of a ready-made blouse (bought at Target). I was fortunate enough to find a free downloadable alphabet from Aunty M designs at The Stitchery Mall . It's called "Fanciful Alphabet" and includes uppercase and numbers. I removed the pocket from the blouse, hooped tear away stabilizer, spray basted the pocket (only) to the hooped stabilizer and stitched away! After the embroidery was done and the excess stabilizer removed from the back, I re-stitched the pocket onto the blouse.